Evaluating early season college basketball is notoriously difficult. The skewed competition levels make it tough to decipher real change or improvement from the product overmatched competition. Any sign of improvement is met with the rational question of: how will that work against better teams? At a certain point, trends start to become so obvious that there’s no other choice than to accept them. Through 80 minutes of basketball in 2016-17, DJ Wilson has emerged as one of those trends. Wilson has grabbed more rebounds in two games than he did in 25 games last season. He finished with 7 points, 14 rebounds and five blocks in 30 minutes and was easily Michigan’s MVP in a Sunday afternoon win over IUPUI. When Wilson was on the court the Wolverines outscored IUPUI by a team-best 23 points and he was continuously involved on both ends of the floor. John Beilein noticed the pattern as well as well, inserting Wilson into the lineup at half time and giving him 17 second half minutes. After averaging close to a double-double through two games, it wouldn’t be surprising to see the 6-foot-10 forward in the starting lineup when Michigan takes the floor at Madison Square Garden on Thursday. The Wolverines knocked off IUPUI in comfortable fashion, even after a rocky defensive start, thanks to a critical 13-0 run to close the first half. The Wolverines’ final margin of victory would have been even more decisive if it wasn’t for the Jaguars closing the game out with a 7-0 run against the end of the U-M bench. Offensively, Michigan feels like a team trying to figure out what it wants to be. The Wolverines went through phases where the offense was driven by different factors: Zak Irvin’s mid-range game, Muhammad-Ali Abdur-Rahkman’s off-the-dribble game, Walton’s three-point shooting, 19 second chance points, Moritz Wagner isolations on the low block. All of the different pieces to the puzzle were there on Sunday, but they never seemed to flow smoothly from one to the other. Michigan’s 1.15 points per possession qualifies as a solid offensive performance overall, but it felt distinctly un-Michigan as the Wolverines rebounded nearly a third of their shots and only attempted 35% of their field goals from three-point range. The Wolverines did make half of their two-point attempts (51.2%), but left a lot of points on the board with missed layups or tip-ins. The Wolverine defense struggled out of the gate and there was no secret as to why. The Jaguars put the ball on the deck and drove right at Michigan defenders — especially Duncan Robinson — and had a lot of success. IUPUI senior Darrell Combs was almost unstoppable — 22 points on 10-of-16 shooting — but the Wolverine defense improved after a dreadful 15 minutes. Containing dribble penetration was a major issue last season and it’s clear that those issues haven’t been completely resolved — although there was some improvement over the final 25 minutes of play. 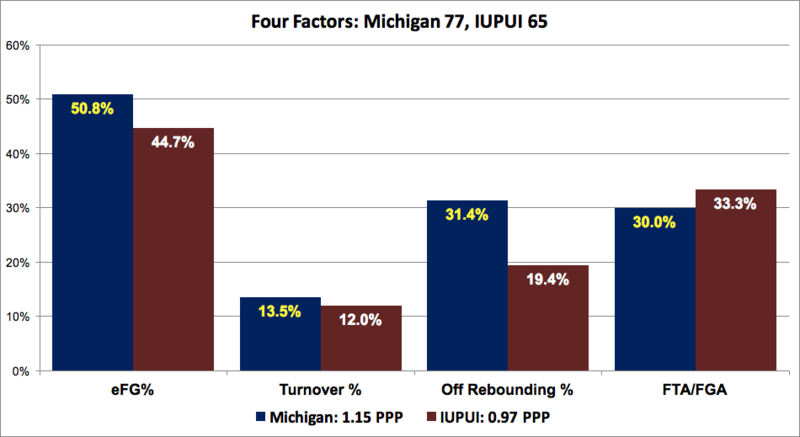 Michigan will be pleased to hold an opponent under 50% two-point shooting (42%) and to have rebounded 77.4% of IUPUI’s missed shots, but I’m not close to ready to declare this a significantly improved defense just yet. One takeaway that I would feel comfortable making is that this is a more aggressive look overall in terms of deflections, blocks and steals — the steals (4) didn’t materialize as clearly as the blocks (7) in this game, but the deflections are there and there were 9 live ball steals in the opener. The Wolverines are going to have their work cut out for them in New York City this week. Marquette blitzed Vanderbilt on Friday night and is an up-tempo team with athleticism and offensive firepower that will test this defense. A potential Friday night game with SMU — a program that has had Michigan’s number over the last two years — isn’t going to calm the nerves either. DJ Wilson: I laughed when Beilein said that he wants DJ Wilson to play like Troy Williams during a radio interview this summer. Wilson hadn’t show any of that motor, in-game athleticism, or mentality to play a role like that. His 7 point, 14 rebound, 5 block, 1 assist performance was a lot closer than I ever thought he could come this early. As mentioned above, I’m not sure how long it can last and how consistently he can bring this sort of effort against better opponents, but Michigan certainly needs it. A few nitpicks: Wilson still needs to go up and finish stronger around the basket and he’s also struggling to keep smaller defenders in front of him despite the fact that he can sometimes to catch up and block shot attempts at the rim. Derrick Walton: Walton continues to be Michigan’s most consistent three-point threat (3-of-7 tonight), but he was 0-of-3 inside the arc and matched his three assists with three turnovers on Sunday afternoon. He turned in his normal reliable 6 rebound and 4-of-4 free throw shooting performance, but wasn’t quite as flawless offensively as he was in the opener. Muhammad-Ali Abdur-Rahkman: Abdur-Rahkman tends to drift out of the offense at times, but he picked his spots with a few of his standard picturesque drives and finishes with scoop layups, floaters and everything in between. Abdur-Rahkman has seemed to settle for the three a bit too early this year (3-of-8 for the season), but he also handed out a couple of nice assists including a no-look ball screen feed. Zak Irvin: Irvin’s most-efficient shot appears to be the 18-footer on the move. He’s been as consistent with that shot over the first two games of the season as he’s been inconsistent with his three-point stroke (0-2 tonight) and attacking the rim. Irvin did hand out three assists and seemed to move the ball well. He also left the game mysteriously in the first half and went to the locker room. Moritz Wagner: Wagner’s offensive ability at the five position continues to intrigue, but he needs to shore up the gaps in his defensive effort and discipline. Wagner scored on a drive from the top of the key, a face up baseline move in the post, a three from the top of the key — the offensive talent is there and he has the ability to be a game changer on that end of the floor. But Mark Donnal is playing much better, more consistent, defense and that’s going to leave Beilein with some difficult decisions to make. Mark Donnal: Steady and consistent, Donnal gave Michigan quality minutes once again. He scored 8 points and grabbed 3 rebounds, providing a reliable ball screen outlet and battling down low to keep several loose balls alive. His ceiling doesn’t match Wagner’s, but he’s far more likely to make the proper defensive rotations and bang down low than the German sophomore. Michigan got a combined 21 points and 9 rebounds from its big man duo, and it would take that. Duncan Robinson: Robinson only played 12 minutes, scoring 7 points, and it was clear from the opening jump that IUPUI planned to attack him off the dribble on almost every possession. His struggles on the defensive end were bad enough to cut in his minutes significantly and I wouldn’t be surprised to see him move to the bench — both to give DJ Wilson more minutes, and to give U-M more shooting punch off the bench. Xavier Simpson: Simpson played just 6 minutes and recorded a steal and a foul, but I liked what he brought to the floor defensively in the first half. Beilein put him in the lineup for Walton and he did a great job helping U-M get a few stops after early struggles. He’s struggled to get involved offensively and seems to be more focused on not making mistakes on that end than making a play. Ibi Watson: Watson was just 1-of-5 from the floor, scoring his only basket on a transition dunk and missing all four three-point attempts. He’s clearly going in the game to shoot so I have no problem with the 4 three-point attempts, but they’re going to have to start falling to earn more minutes.